Analysis: Like the winner in almost every year in the decade, Streetcar is one of the finest films ever made – its four performances all appeared in my Top 10 of all-time. The Top 5 is down a little from the year before, but still in the top 5 of years to date. And it continues through – La Ronde is the fourth best #8 film to this point. As with several years in the decade, the Academy got two of the films really right and a bunch really wrong. A Place in the Sun only places 5th on my list, but how it actually lost Best Picture at the Oscars is a complete mystery, perhaps the biggest in Oscar history. It set a new record for Oscars for a film that didn’t win (6), a record which wouldn’t be broken for 21 years. It was only the fourth film ever (and the second film in the five BP era) to win Director and Screenplay but lose Picture. It is one of only two films to win Director, Screenplay and Editing and not win Picture. It is the only film in history to win Director, Screenplay, Editing and Cinematography and still lose Best Picture (and for good measure, it also won Score and Costume Design). Analysis: A year of great directors – the top 7 are in all in my Top 100. For the second year in a row only two of my Top 5 films earned Best Picture nominations, but 4 of the top 5 directors were nominated. 1950 had the second highest differential between Picture and Director (the highest in the 5 BP era); 1951 has the sixth highest. The average BP nominee is a 79.4; the average BD nominee is a 90.2. In spite of never having won a Nighthawk Award, William Wyler, with his 8th nomination moves into a tie with Howard Hawks for 1st place, with 360 points. This is the 5th nomination for Hitchcock, the 4th for Huston (pushing them both into the top 10 in points), but the 1st for Kazan and the 1st (and surprisingly, only) for Stevens. Analysis: Unlike 1950, where I had only read two sources, here I have read all but two (Detective Story, La Ronde). This is a year of scripts triumphing over the source material. True, Streetcar is one of the greatest plays ever written. But, An American Tragedy (the source for Place) is overlong and the film nicely pares it down, The African Queen takes a little adventure story and makes it a great film, Strangers brilliantly focuses the Patricia Highsmith novel to its core and Oliver Twist is able to peel away layers of sentimentality and stick to the darkness of the story. This year really needed a Eugene O’Neill adaptation to complete the holy trinity of American playwrights. Analysis: One year after the best in this category from Hollywood, we have a considerable drop. I can’t even fill the category and three of the four aren’t from Hollywood – one French and two British. An American in Paris is the Consensus winner, which is ridiculous, since the script is the worst thing about the film. This is the fourth Nighthawk win for Wilder (plus two wins in Adapted) as he continues to dominate the writing awards. Analysis: Bogie, probably my second favorite actor of all-time, behind Alec Guinness, wins the Oscar and comes in 2nd on my list. That’s because Brando’s performance is possibly the greatest and possibly the most important piece of acting in film history – and yes, it doesn’t even earn a Consensus nomination because only the Oscars nominated him. But Bogie does finally pass Claude Rains on the Nighthawk points list, moving up to 440. And Kirk Douglas moves into the Top 10 in points with his two nominations (just four years after his first points – a meteoric rise); it’s annoying that neither was nominated by the Academy, although, as can be seen from my Top 8, the Academy did at least make good choices. Clift earns an actual Nighthawk nomination because of the two nominations for Douglas. Analysis: The last time Katharine Hepburn earned a Nighthawk nomination (in 1942), she was 30 points behind Bette Davis for 1st place. After her nomination here she is 145 points behind. Leigh moves into the Top 10, but this will actually be it for her, as she ends with 175 points. Analysis: Like the year before with Kind Hearts and Coronets, I decided that Alec Guinness was primarily a supporting role, which works much better for him in this year, moving him out of a very crowded Best Actor race. Analysis: Why only six? Because that’s my whole list. This is the first nomination for Grant and Dunnock, the last for Hunter and the only one for Sterling. Sterling’s Consensus nomination is for lead (the NBR placed her there but I don’t). Analysis: The winner actually makes my list of nominees, which is better than usual. What can you say about an organization that think the slow, plodding pace of Quo Vadis is more worthy than the editing in Streetcar, Detective Story, La Ronde or Strangers? I had 17 films on my full list and Decision Before Dawn was the only other Oscar nominee on the list. Analysis: Not a one of these cinematographers are among my Top 15 in points yet, but Harry Stradling (my winner) is rising up and Jack Cardiff (David Lean’s cinematographer on Oliver Twist) would later become an Oscar-nominated director. We’re still in the period of black-and-white dominance, with my top color film being my #7. Analysis: Franz Waxman continues to inch closer to 2nd place; he’s now up to 225 points for his Oscar-winning score for A Place in the Sun. The Strangers score is by Dmitri Tiomkin, another big name, who earns his 4th Nighthawk nomination. Miklos Rozsa would earn his 5th, but his score for Quo Vadis ends up in 6th place. That’s the fifth time to date he’s finished in the Top 10 but not in the Top 5, and it will happen again in each of the next two years. Alfred Newman doesn’t have a single score anywhere on my list for the first time since 1944 (although the Oscars nominated him in both Score categories – for David and Bathsheba (Dramatic or Comedy) and On the Riviera (Musical)). Analysis: I don’t know what surprises me more – that they gave the award to the mediocre The Great Caruso, or that they didn’t bother to nominate a musical they actually gave Best Picture to? Analysis: For the second year in a row they get this category absolutely right in black-and-white, going with the brilliant modern sets rather than any period pieces. Analysis: Things continue to improve in this category with the ever expanding list of Sci-Fi films. 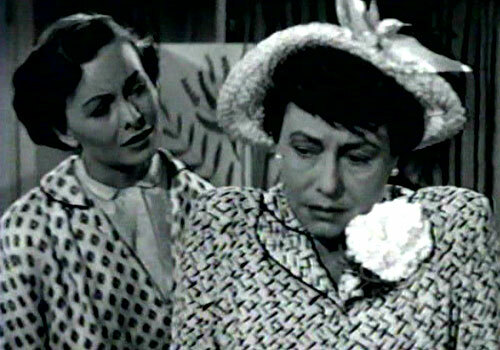 Analysis: A Place in the Sun won for black-and-white, the only one of its 6 Oscars that seems odd. They must have loved the dresses Elizabeth Taylor wears. Analysis: It’s interesting that Alice and Peter Pan (following in 1953) are two of my absolute favorite children’s books, both were books that I read after watching the Disney films as a kid, and yet, both are in the lower ***.5 range for me. They are both charming and smart and funny but they are a dip in quality between Cinderella and The Lady and the Tramp. 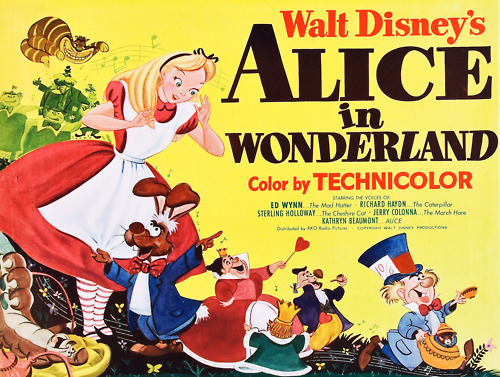 Alice, in fact, is the weakest of the five Disney animated films in the decade. Analysis: Let the reign of Kurosawa and Bergman truly begin. Rashomon wins the Consensus by winning the Oscar and the NBR (a combination that surprisingly won’t happen again until 1962 with Sundays and Cybele). 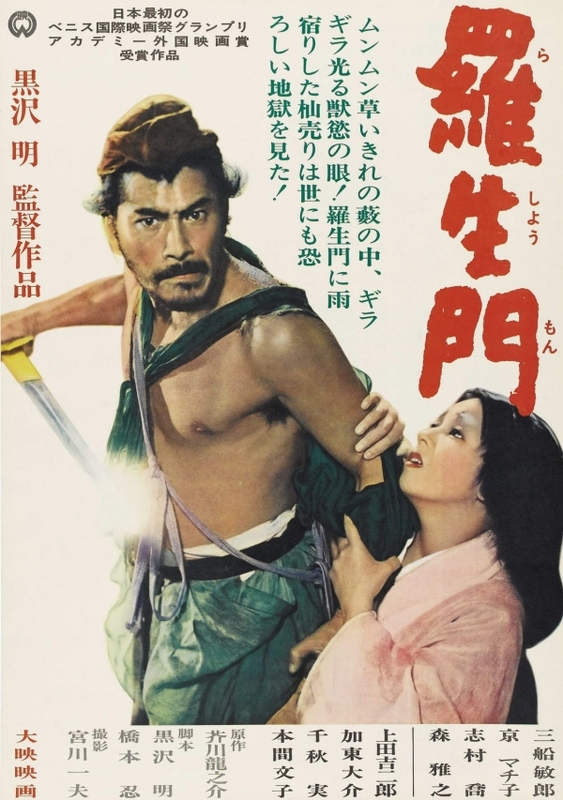 Rashomon really should have been in 1950, but the Academy gave it the Oscar here, so it gets moved to here. That’s Kurosawa again in 3rd place (the two nominations move him into 2nd place, passing Carné) and Bergman in 4th. Japan becomes the first country with three nominations in one year since France in 1938. Analysis: Oliver Twist becomes one of the most successful films to date to fail to earn any of the big three awards. Analysis: A very good film noir with the last performance from John Garfield (a quite good one) before he died. It earns one 6th place finish (Actress), but is otherwise not ranked higher than 9th in any category. It is my #12 film of the year. Analysis: The previous few years this spot has been reserved for an over-rated film that ended up in the Best Picture race at the Oscars. With every one of the Best Picture nominees earning at least one Nighthawk nom, it’s Bright Victory, a solid (though very hard to find) drama starring Arthur Kennedy (who was Oscar-nominated and was #8 on a very strong Best Actor list). He won the NYFC, the film won Best Screenplay at the Globes and Best Screenplay dealing with a Problem at the WGA (in the final year for that short-lived category). It also earned an Oscar nom for Best Sound and Globe noms for Picture and Actor. That all was enough to earn it 5th place in points, ahead of Quo Vadis. Analysis: The same as the list above, of course. Kudos to the Globes for nominating Detective Story. Analysis: Wyler earns his 10th Nighthawk Drama nomination, all with no wins. But that means he’s 135 points ahead of any other director in this category. Analysis: Bright Victory would win the Globe; it would be the only film until 1986 to win the Screenplay category at the Globes (where it is not divided) and not earn an Oscar nomination (where it is divided, so there are more nominees) and is still the only film to ever win the WGA and Globe and not earn an Oscar nomination. Analysis: With this win, Wilder breaks his tie with Emeric Pressburger and takes over 1st place in the Drama – Writing category. Analysis: The Globe winner was Fredric March. Bogart simply increases his lead for Drama points while Douglas leaps all the way into 6th place. Analysis: Hepburn may be in 2nd place in overall points, but because so much of her work is in Comedy, this only moves her up to a tie for 4th place (with Leigh). Analysis: Guinness makes his first appearance in Drama, but it won’t be until Bridge on the River Kwai where he returns – the years in between are all about the Ealing Comedies. Analysis: With all the great films being Dramas and all but one of them having Adapted Screenplays, there just wasn’t room for La Ronde in any of the categories. Analysis: There are only 15 films from the year that earn **** or ***.5 and thus qualify. This is the only Comedy / Musical. The next best, Hue and Cry, is #22. 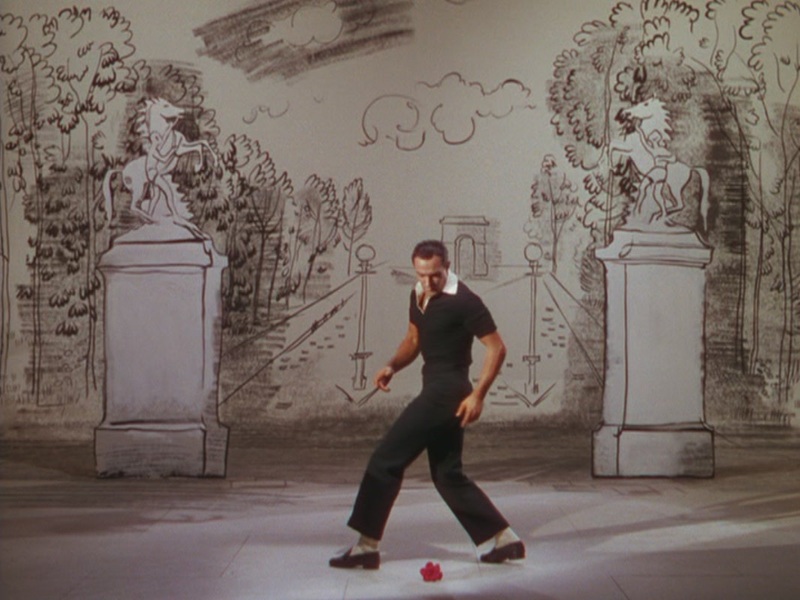 An American in Paris, which won the Oscar and the Globe (the first in the new category), would be my #5 Comedy / Musical of the year but only #33 for the year as a whole. Analysis: The script is part of the reason that Alice doesn’t quite become a classic – just a bit too unfocused. Analysis: The next year, for a much better performance in Singin in the Rain, Kelly won’t win (because of Alec Guinness). Yet here, he wins with no competition. The luck of the draw. Analysis: Yes, a very weak year. But Ritter is quite charming in a rare lead role. Jeanne Crain is actually top-billed, but she’s not very good and there’s no question that Ritter is the lead role. Much better than her Oscar-nominated performance in The Mating Season, which I didn’t choose even though she would have won the Supporting Actress – Comedy category by default. Analysis: There really just isn’t much for the year. The next year will be a vast improvement. Analysis: A quite good Italian comedy. It was #29 on the year, making it the fourth-best in the Comedy / Musical, but wasn’t good enough in any category. Analysis: Almost a full point drop from the year before. There’s a lot less at the top than there was in 1950. Best Picture: Ranks at #56, which is a little bit of an improvement over the two previous years, though still down considerably from 46-48. That’s only because while the average rank of the five nominees is almost the same as 1950 (262.6 in 51, 260.8 in 50), the average film is slightly better (79.4 to 76.6). If the Best Director nominees had been the Best Picture nominees this year (The African Queen and Detective Story instead of Decision Before Dawn and Quo Vadis) would have ranked at #7. The Winners: It’s a pretty solid year – the average winner ranks 1.95 among the nominees with only two of them ranking lower than third (unfortunately they are Picture and Director – good thing I don’t weight the ranks). In the start of a good trend, it is the first year where I agree with three of the acting choices. Overall, the rank is a 4.77, which isn’t bad and there are only two categories that have a winner ranked lower than 8th (Picture and Sound). But it’s Picture that brings it down – if you factor that out (which I do because it’s the one category where I rank every film of the year), the year gets a 3.43. The Nominees: Overall, the score is a 63.7, the best since 1941. This time it’s the major categories that bring things up. The Tech categories earn a 49.2, about where other years have been. But the acting is an 83.3, the best in seven years, lead by Best Actress, with a perfect 100 (in other words, I agreed with all five nominees). And the big categories (Picture, Director, writing) earn a best-to-date score of 72.2. Picture is a waste (44.7), but Director is an incredible 78.9 (second best to date) and Screenplay is an amazing 97.4 (by far the best to date). The best of an amazing career. There is a moment in Strangers on a Train where we realize what is going on. Bruno Antony, who, by this time, we have realized is a complete and utter sociopath, is watching Guy Haines, the star tennis player. We get a shot of the crowd at Forest Hills and with each volley we see all the people in the stands moving their heads from side to side, watching the incredible plays. In the middle sits Bruno. He is not moving at all. He is watching straight ahead, with his eyes only on Guy. It is a masterful shot and it makes it all clear. The nominal star of the film is Farley Granger, the young actor who had already starred in Hitchcock’s experiment in film, Rope. Though these two films would define him (his career was long, but it peaked in these years with these two films), neither would showcase his actual acting abilities as They Drive By Night would. Granger is the hero of the film, the young man who is followed by the sociopathic Bruno, a man who kills Guy’s wife (so he can be free to marry his new lover) and wants to Guy to return the favor and kill Bruno’s father. Granger is effective in the role and clearly the lead role – his face is prominent on the poster and he receives top billing. But sitting there, watching the menacing performance by Walker, realizing just how focused he is, how good a performance this is, we realize, that in spite of being third billed (Guy’s lover gets second billing), he is the star of the film. Walker began in small roles, most notably the boy next door in Since You Went Away. In the kind of Hollywood relationship story that so interests my mother, Walker was playing opposite Jennifer Jones, his wife and the mother of his two children (the older one, Robert Walker Jr., would later be a film actor and looks eerily like his father), but Jones was already heavy into her affair with David O. Selznick (the producer, who was making them play young lovers) and playing opposite each other in this way (with her new lover looking on) was the death knell for their marriage. 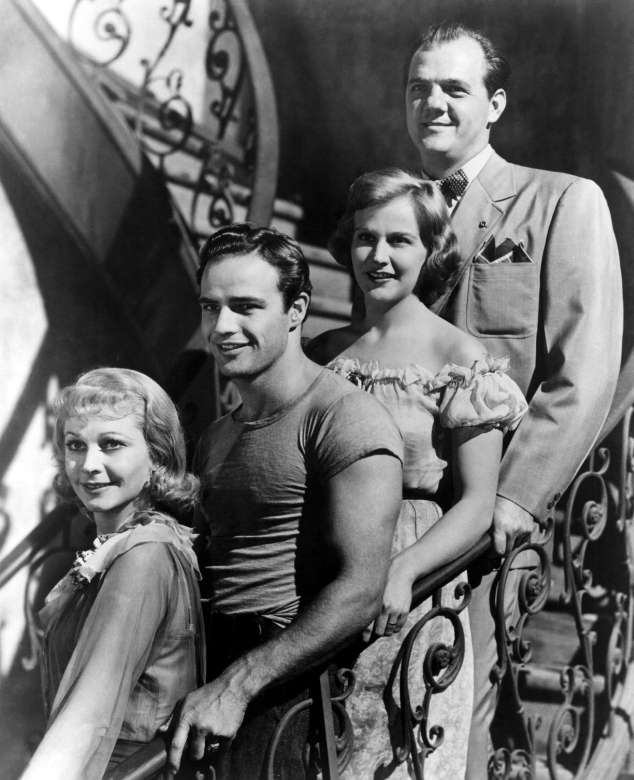 Walker would continue in roles of increasing size (he gives a nice performance in The Clock, opposite Judy Garland in a role the polar opposite of his one here) but he had not yet achieved stardom by the time of Strangers. He never would. Just two months after the film he would be dead, killed by a bad reaction to an injection. Walker had struggled with many issues in his life after his divorce, including heavy drinking and a nervous breakdown. But here he gives a tight performance, always in perfect pitch, being friendly when needed, psychotic and menacing when he has to be. Of all the truly great directors there might be more debate about what is Alfred Hitchcock’s best film. The type of critics who vote in Sight and Sound would definitely go with Vertigo. The Academy gave the Oscar to Rebecca. The voters on the IMDb have Psycho and Rear Window back to back on their top movies list. A lot of people (including my mother, I would guess) would go with North by Northwest. Hitchcock himself often said that Shadow of a Doubt was his favorite of his films (although he denied it in his book with Truffaut). But of all the greatness, I would crown Strangers on a Train at the top. It has all the perfect Hitchcock elements, with a bit of a twist. We have the innocent hero, but who isn’t as innocent as he would like to be (he did discuss the idea after all and he did know it might happen, even if he didn’t believe it). 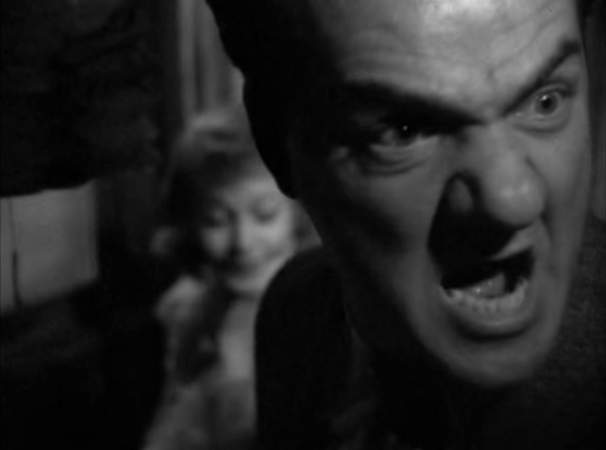 It has the best villain – the menacing performance by Walker is one of the best in any Hitchcock film (to be fair, I don’t consider Mrs. Danvers a villain). It has one of the best scripts. 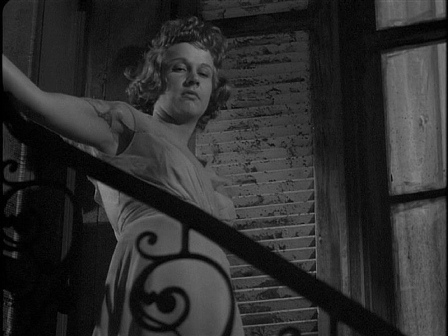 It has possibly the best cinematography (a tall order on a list that includes Rebecca, Notorious and Rear Window). It’s got wit, it’s got style and it’s got (especially at the end) a whole lot of suspense. Exactly what we always wanted from Hitchcock. Hard to find but definitely worth the effort. There’s a video store in Portland called Movie Madness. It’s not just the best video store in Portland; it might be the best video store in the world. That’s because it specializes in having videos that no one else has – films that aren’t, at times, technically available. That was where I first found Detective Story back in 2003 at a time when it was unavailable anywhere else. Even though at the time, I hadn’t even seen all the Best Picture nominees from 1951 (I wouldn’t find Decision Before Dawn until it was released on DVD a couple of months after I joined Netflix in early 2006), it was the film I most wanted to see from that year. 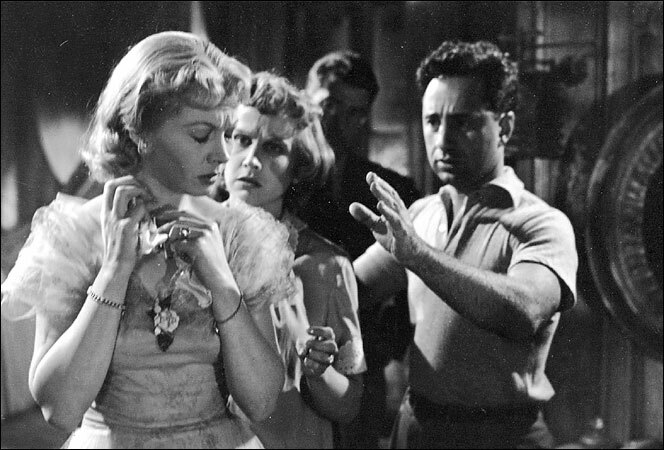 It had been nominated for four Oscars, all of them major (Director, Screenplay, Actress, Supporting Actress) and three Golden Globes (Picture, Actor, Supporting Actress), was directed by a major director (William Wyler – his 8th of 12 Oscar nominations) and starred Kirk Douglas, who I already was thinking of as one of the best actors to never win an Oscar. I was rewarded beyond what I expected. First of all, this would be much better than Decision Before Dawn (a low-level ***.5 film). It would be much, much, much better than the Oscar winner for Best Picture, An American in Paris. It is a taught crime drama, revolving almost entirely around a police precinct (it’s easy to see how it was staged as a play, but it also opens things up in smart ways that don’t seem like a play obviously trying to open up). It has a fantastic performance from Kirk Douglas – one of two on the year that sadly went un-nominated (it was a very good year for Best Actor). But there was so much more. There was the tragic performance of Eleanor Parker as Douglas’ wife, who has a past that Douglas knows nothing about but which will end up destroying them (in spite of the lack of screen-time, the Academy wisely nominated her). There was the incredible performance of Lee Grant, in her film debut, as a shoplifter who is brought in at the beginning of the film and watches all the action unfold around her (she had been in the play on Broadway). And there are the myriad of strong performances among the other policemen, most notably William Bendix, in one of his best performances as Douglas’ partner, and Horace McMahon as their Lieutenant. I don’t want to say too much about what unfolds over the couple of hours (it seems to unfold in not much more time than that on-screen). All of the characters end up being important – from the policemen hanging around until their shift is over (the one who brought in Grant is forced to wait for night court to begin) to the various suspects under arrest. Those who might not be dangerous might actually be and those who you think of as good might not be as good as you would want. But each of them is a fully realized character and each of them gets a fully realized performance from a strong ensemble cast. Unlike Streetcar, which is so built around the four key performances, here the entire ensemble seems a gathered whole. 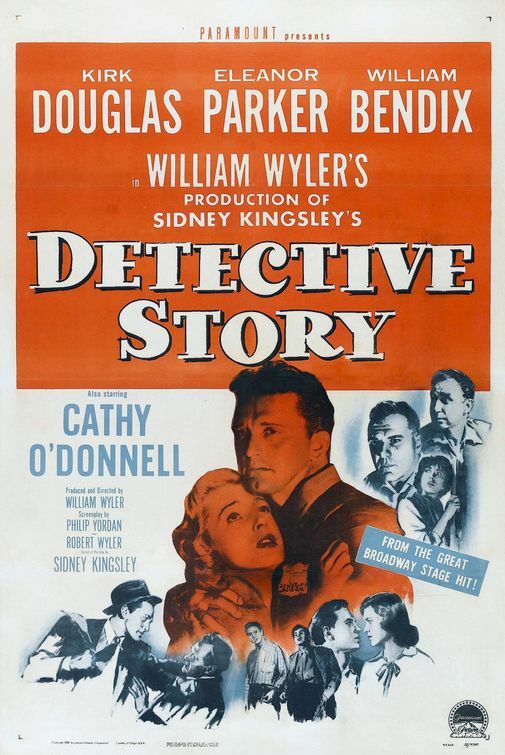 All of this is to say that Detective Story is a first-rate film, one of the best of the long, impressive career of William Wyler, a career that included 3 Oscars for Best Director. It has one of the best performances of Kirk Douglas. If you get a chance to see it, by all means, do so, however you have to. Not only a great film, but also inspired a near-great film. I wonder how many movies have been made about making a specific movie. It’s been a trend lately (My Week with Marilyn, Hitchcock, Saving Mr. Banks) but it’s been going on for a while. It’s possible that the best combination of original film and film about making that film are The African Queen and White Hunter, Black Heart. 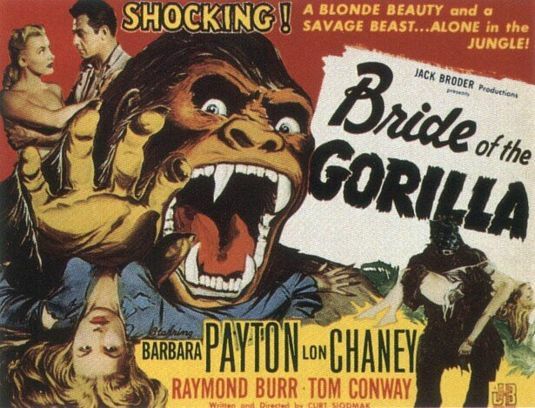 Since you could watch White Hunter to learn all about what went on backstage (it’s somewhat fictionalized, but you’ll get the drift), I’ll stick to the film at hand. I think that no matter who starred in this film it would have been great entertainment. Like some other great films (The Wizard of Oz, The Princess Bride), this film is several things at once. At its heart it’s an adventure film, with two people traveling down-river by boat through the heart of Central Africa, dodging danger (a German fort where they are fired upon), dealing with wild animals (laughing at a hippo but also yanking off leeches) and generally having a hell of time (sometimes good, sometimes just hell). But it’s so much more than that. It’s a War film – after all, they are running down the river partially to escape the oncoming Germans (it’s the start of World War I) and partially to try to take out the fearsome German boat that’s sitting on the lake and controlling the heart of Africa. It’s a Comedy (there are so many funny bits, though my favorite is Bogie making faces at the hippos) but it’s also a Drama, with so much danger all around and the constant peril of death, from the river, from the animals, from the Germans. And of course, anyone who has seen it knows it’s a Romance, with the two characters thrown together (he captains the boat, she’s a missionary and the sister of a minister who dies in the jungle and leaves with him due to the danger) eventually falling in love, as anyone can see they would. Yes, it’s got everything a film needs to be great fun. Ah, but then there are the stars: Bogie and Kate. Bogie is the consummate star – possibly the biggest star Hollywood ever produced (and, at this point, the leader in Nighthawk points). Kate was both a huge star, an acting genius (she will eventually take the lead in Nighthawk points) and a brilliant comedic actress. And of course they were being directed by John Huston, one of the greatest of all-time (I ranked him #14), the consummate adapter (there’s no writer-director better at bringing novels to life on screen). Bogie knows when to play it straight (his desperation when he wakes up from his bender) and when to go more for laughs. And Hepburn gives her first great performance in nearly a decade. Kate was nominated for the Oscar and Bogie actually won (it kills me not to give Bogie the Nighthawk for his Oscar-winning role but that’s on the Academy for not giving it to him when he should have won (Casablanca) or not even nominating him when he should have won (The Petrified Forest, Treasure of the Sierra Madre) and in most other years they would both win, but not in the year of Streetcar. Still, this is a great film and you leave it feeling great (it has the perfect kind of happy ending and it’s so entertaining you can’t help but be joyed when you’re done watching it). Why have I seen this? I don’t know, but I wish I hadn’t. I’m not certain why I’ve seen this film. It’s not my kind of thing. But I have seen it and it’s the worst film of the year by a whopping 17 points – it’s a low-level *.5 when the next worst film is a mid-level **. So what makes it so bad? Well, take your pick (and if you don’t believe me, it’s in the Public Domain, so it’s readily available all over the web). You could start with the truly horrendous acting. Yes, there’s a real actor in the film – Raymond Burr – but this is Godzilla Raymond Burr sleep-walking through his lines, not Rear Window menacing Raymond Burr. There is, of course, Lon Chaney Jr., but he was really more of a presence on-screen than an actor – he could be charming and sometimes funny but he was so perfectly cast as Lenny in Of Mice and Men because he just seemed that way and it’s reflected in all his other performances. Anyway, I think he is cast in this for the connection to The Wolf Man, an infinitely superior example of this type of film (man under curse transforms into beast), even though he’s not the one transforming this time. The rest of the cast isn’t bad – that’s far too kind a word for the wooden pathetic masquerading that goes on in this film, especially from Barbara Payton, the star who’s neither good nor desirable (either as an actress or as a character). You could choose the plot – man kills employer to get employer’s wife. Except throw in some horror (man now turns into gorilla). It manages to be cliched and stupid all at the same time. It’s not enriched by any sort of meaningful dialogue (made worse when it is so badly delivered). And while I often rant about the pathetic screen values of some of my “worst films” I can’t even do that this time. Maybe that’s part of the problem this time. This is a B-film but it never looks that much worse than a studio film. It never looks like it’s cheaply made (though it is) and so the acting and writing bring down what shouldn’t have been such a bad film. *** – Oliver Twist is the first film unlucky enough to earn 6th place finish in each of the biggest three categories. Analysis: With 12 fewer films several genres drop from the year before: Crime (6 fewer), Drama (11 fewer), Foreign (7 fewer) and Western (7 fewer). The only genre to go up significantly is War; it’s the highest since 1943, probably because of the conflict in Korea. Many of them go down in quality as well – Comedy has its lowest score since 1945, Crime its lowest since 1945 and Westerns, with 7 fewer films, drop 11 point (also the lowest since 1945). We are in the midst of the powerful Dramas. From 1949 to 1955 every #1 film is a Drama (two of them Foreign). For the third time in four years there are 7 Dramas in the Top 10 and they account for at least half of the Top 20 for the fourth time in seven years. 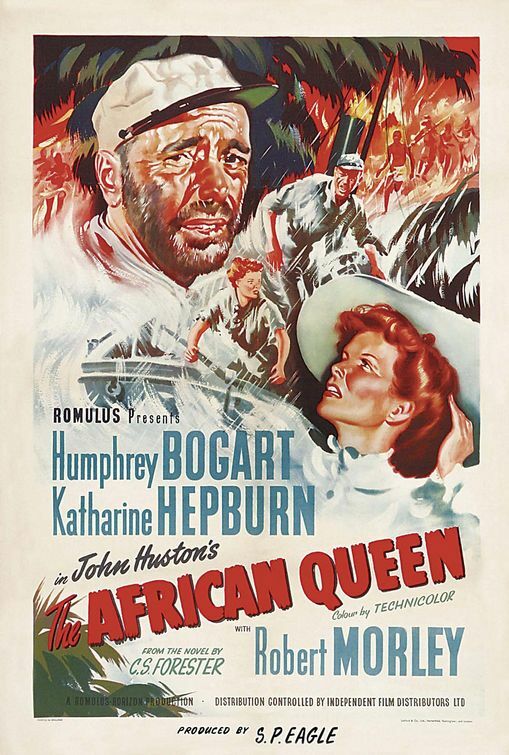 The first big surprise is The African Queen, the first Adventure film to make the Top 10 since 1939. The second is the absence of any Comedy films in the Top 20 (the first time since 1946) and no Crime films in the Top 20 (first time since 1944). With fewer films I get more studio films again – 76% of the total. That’s lead by MGM (23), 20th Century-Fox (17) and Warner Bros (12 – its most since 1943). After accounting for at least 10% of the films I’ve seen in every year from 1930 to 1943, this is the first time since then that it gets over 10% of the total. United Artists has by far the best films (its 8 films average a 76.6 – the best for UA to date and the best from any studio since RKO in 1941) while Universal has the worst (it 5 films average a 60.6 – down 15 points from the year before). The wealth is still spread a bit. No studio has more than 4 films in the Top 20 and only MGM doesn’t have a Top 20 film. UA has multiple Top 10 films for the first time since 1945 and Warners has multiple ones for the first time since 1943 while Fox has no Top 10 films for the first time since 1945. After taking until 1943 to win Best Picture, Warners wins its third in less than a decade. Note: Japan has 5 films – its most since 1935 but it’s outpaced by Mexico which has a whopping 7. That makes 33 films from Mexico to date – more than Italy or USSR (32 each). Note: These 15 films average a 72.3 and include my #6, #8 and #12. Note: These films average a 73.8. It includes what would have been the best film of the year, two other **** films and 4 ***.5 films. 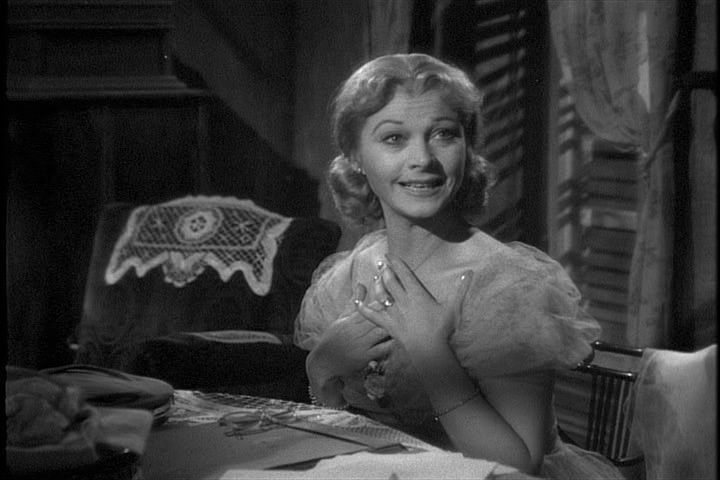 I can watch A Streetcar Named Desire over and over again just for the performances alone. The best acting ever recorded, I agree. Vivien Leigh, Karl Malden, and Kim Hunter had no serious competition that year in their categories. 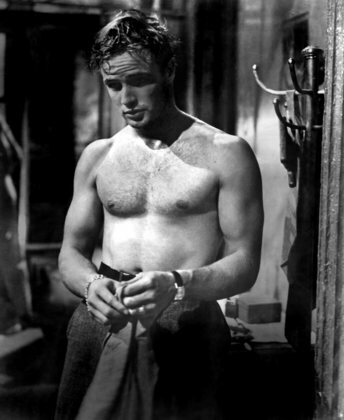 Marlon Brando, as good as he is, barely edges out Arthur Kennedy. This is completely off topic, but I was wondering what your opinions were on the subject of Honorary Oscars. I mean, when they announce that Maureen O’Hara, Steve Martin, or Angela Lansbury are finally getting Oscars, is your reaction a positive or negative one? Honestly, I only thought it had a point when it was part of the show. They gave an Oscar to Blake Edwards who never even remotely deserved one, but it reminded us of his long career and what he meant to the industry. What’s the point in shoving that out of the show? I suppose it is nice for a person like Gordon Willis, who had deserved multiple Oscars, to finally get even an honorary one. But look at Paul Newman – they gave him the honorary one and then he won Best Actor the next year. The same thing happened with Henry Fonda, of course, in 1980. And those “juvenile” Oscars were a joke (all of them except for Judy Garland), and why on earth did they have to give one to two-time Best Actor winner Gary Cooper? Some of their choices just do not make sense (although I do think that they have become of the mind that only those who are not likely to win competitively should be honored; they just jumped the gun with Paul Newman). But I actually like the decision they made to move the presentations to a separate ceremony, if only so that they can honor more people in a given year. Seventeen people have received Honorary Oscars since they instituted the Governors Awards, which is the same amount as were honored from 1994 to 2008. One could argue that some of them don’t necessarily deserve them, but we can hardly predict that talents such as James Earl Jones and Gordon Willis would still have been named Academy Award recipients had they not come up with this new system and allowed for more slots. Ah, it’s good to see someone else who doesn’t think much of Blake Edwards. Of course, you still liked Breakfast at Tiffany’s and Pink Panther makes your Top 20 for ’64, while I couldn’t get through 45 minutes of it. I do kind of like The Great Race, but even it suffers from the same weirdly desperate sense of humor that marred PP. By the way, any films from 2014 so far that might be contenders for the 2014 Nighthawks? I think it’s actually a solid year so far, but mostly for foreign films. Surely, I give awards to Streetcar in every acting category and also for the amazing Alex North’s jazzy score. And to Strangers I’d give awards for cinematography and editing. 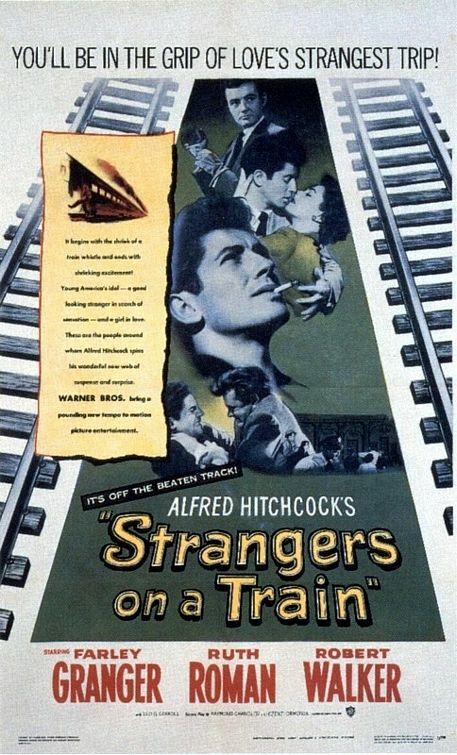 But I can never decide which one is the best picture of 1951: Streetcar Named Desire or Strangers on a Train. When I’m ready to rank Streecar as my #1 movie of the year, I remember I found some dialogues a bit theatrical. When I’m about to write down Strangers as best picture, I remember I found its ending a bit artificial. Two masterworks. Flip a coin.